The Fabryka Samochodów Ciężarowych is an automobile factory in Lublin, Poland, that specialised in large motor vehicles, such as light trucks. The factory is more commonly known by the acronym FSC. The FSC was founded in 1950, and the first vehicle to roll off the assembly line was the FSC Lublin-51 on 7 November 1951. 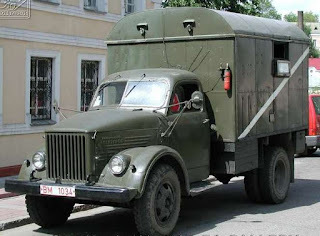 The Lublin-51 was a Soviet truck manufactured by the company GAZ, the first prototype for which was produced before the end of WWII. It went into full production in 1946. The Lublin factory obtained the license to manufacture the vehicle in their factory in 1950. 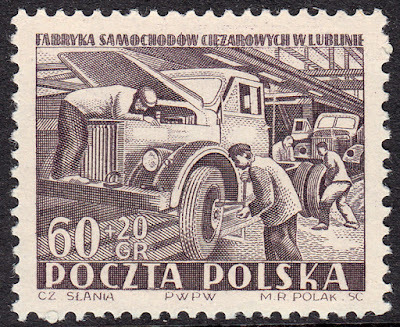 In 1953 Poland issued a set of 2 semi-postal stamps featuring the FSC in Lublin. 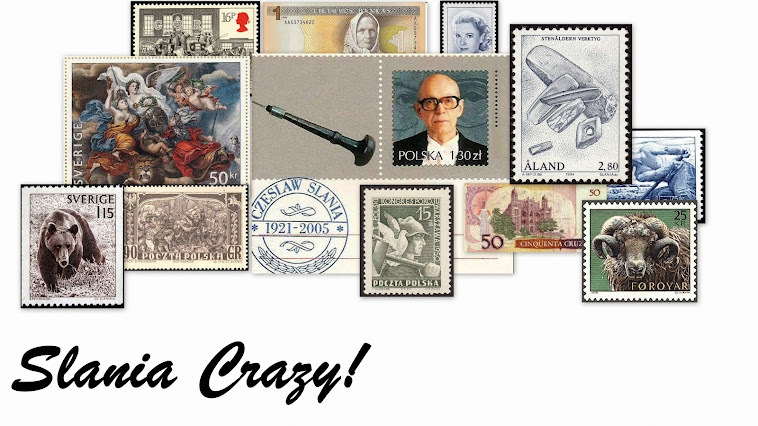 Both stamps feature the same design by Czeslaw Slania. 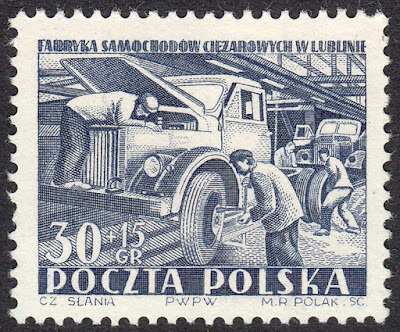 The stamps were engraved by MR Polak. 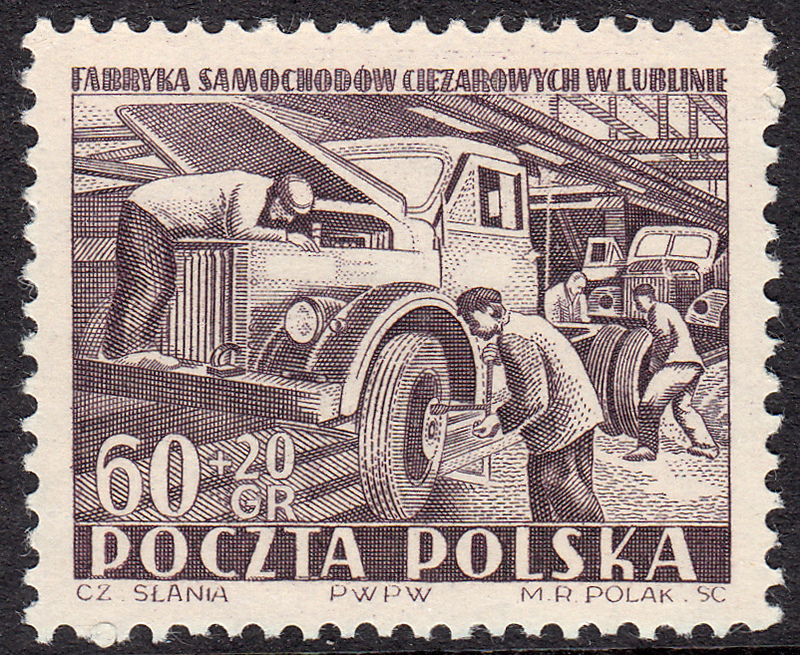 In these stamps we can see the production line in action, as two workers add parts to the Lublin-51. In the background is a vehicle at an earlier stage of production. 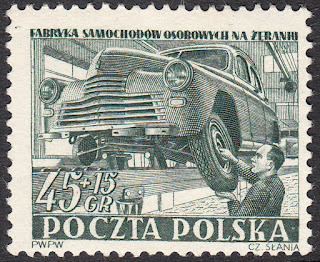 The 1953 FSC Lublin stamp design is similar to Poland's 1952 stamps featuring the automobile factory in Zeran. This particular design was engraved by Slania, and he even went so far as to add his own face to one of the workers. For more on the 1952 issue click HERE.